Time for Fall which means it is time for baking. We love cooking and baking with pumpkins. One of our favorite pumpkin recipe is this Pumpkin Spice Amish Friendship Bread which we add in chocolate chips. If you do not have an Amish Friendship Bread Starter click to get one started. 1-Preheat oven to 325° F.
2-In a mixing bowl add ingredients except chocolate chips. Once mixed, add in chocolate chips. 3-Grease two large loaf pans and pour the batter evenly into loaf pans. 4-Bake for one hour or until the bread loosens from the side and a toothpick comes out clean. I LOVE making this bread for my family. I hope you try it! I just love anything with pumpkin and this looks to die for!!! I might just have to try it out!!! Hope you are enjoying this wonderful fall season!!! Thank you so much! We are the same way around here. I'm going to make a Pumpkin Cheese Cake and will then post it. Happy Fall!! Thanks for stopping in. 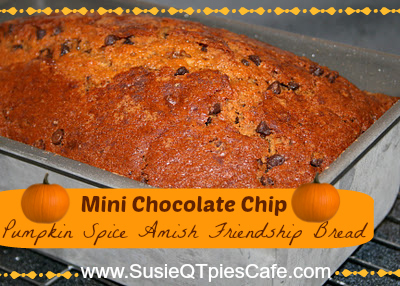 We love Amish Friendship Bread! I'm excited to find the recipe for the starter as well.